Consecrated in 1928 and enlarged in 1961, the Chapel of the Atonement serves as the spiritual center of a religiously diverse school community. It is a sanctuary where students and adults gather for regular services and presentations by students, faculty and guest speakers. Regular chapel services and choral concerts have been a part of campus life at CFS since the School’s founding in 1918 by The Rev. Dr. Charles Wesley Shreiner, an Episcopal priest, and have enjoyed the caring direction of numerous clergy. Today, The Rev. John Daniels serves as School Chaplain and the Head of School, The Rev. Ned Sherrill, assists in guiding the overall program. Mr. Gary Gress is the School Organist and Director of Choral Music. The Chapel’s honored traditions include Convocation, Commencement and the annual Christmas Pageant, Why the Chimes Rang. CFS is part of the National Association of Episcopal Schools that “are Christian communities whose missions integrate spiritual formation into all aspects of the educational experience. Episcopal schools are most distinctive when they are true to this mission and when they do so in the graceful and inclusive manner which is the hallmark of the Anglican approach to education over the centuries. “All Christian communities, even the most ecumenical and diverse of Episcopal schools, are upheld by the basic principles of the Baptismal Covenant. As expressed in The Book of Common Prayer, this Covenant maintains that individuals and institutions are called by God to adopt certain fundamental disciplines and dispositions in order to embrace fully their basic identities. As embodiments of the Christian faith, Episcopal schools are created to be communities that honor, celebrate and worship God as the center of life. They are created to be models of God’s love and grace. They are created to serve God in Christ in all persons, regardless of origin, background, ability or religion. They are created to ‘strive for justice and peace among all people and [to] respect the dignity of every human being.’ These principles are the basis on which identity and vocation are to be defined in Episcopal schools. “Episcopal schools have been established, however, not solely as communities for Christians, like a parish church, but as ecumenical and diverse ministries of educational and human formation for people of all faiths and backgrounds. Episcopal schools are populated by a rich variety of human beings, from increasingly diverse religious, cultural, and economic backgrounds. In fact, the intentional pluralism of most Episcopal schools is a hallmark of their missions. It is also a distinguishing characteristic of these schools that they seek to integrate religious and spiritual formation into the overall curriculum and life of each school community. Episcopal schools are clear, yet graceful, about how they articulate and express their basic identities, especially in their religious curricula and traditions. They invite all who attend and work in them—Episcopalians and non-Episcopalians, Christians and non-Christians, people of no faith tradition—both to seek clarity about their own beliefs and religions and to honor those traditions more fully and faithfully in their own lives. Above all, Episcopal schools exist not merely to educate, but to demonstrate and proclaim the unique worth and beauty of all human beings as creations of a loving, empowering God. that is creative, inclusive, draws fully upon the liturgical resources of The Episcopal Church and is a regular part of school life. in which reflection, prayer and matters of the spirit are honored and the physical, mental and emotional health of all are nurtured. that is meaningful, academically substantive and age-appropriate. which integrates the ideals and concepts of equity, justice and a just society throughout the life of the school. Chaplain John Daniels has been the Chaplain at Church Farm School since September 2011. He earned a B.S. from the University of Phoenix, and spent much of his life in the mortgage business until he decided to leave it in 2004 to pursue a master’s in theology from Virginia Theological Seminary. Throughout seminary, he served as a chaplain for Children’s National Medical Center in Washington, DC, and the Virginia Hospital Center, in Arlington, VA. His ministerial experience includes organizing mission trips to New Orleans to provide relief following Hurricane Katrina; to the Appalachia region of southwestern Virginia to repair and build shelter in the mining community; and an HIV/AIDS pilgrimage to schools and orphanages' in Johannesburg, South Africa. He has also served as the chaplain for The Washington Home in Washington, DC, Community Hospices of Maryland and at Holy Trinity Episcopal Day School in Bowie, Maryland. John has actively engaged Church Farm School students, faculty and staff in his chapel services, as he believes that almost any experience can become a teaching moment. At the school, he also teaches comparative religion, serves as a student advisor and co-runs the school's community service program. John founded the school’s Interact Club through a partnership with the Rotary Club of Central Chester County, and oversees the school’s “Citizen of the Month” program, whereby students are voted on for recognition by the Rotary Club of Chester County by Church Farm School faculty and staff. John is a board member of ECS and a member of the National Association for Episcopal Schools (NAES). On Monday and Friday mornings, our academic community gathers in Alumni Hall for presentations by faculty, students or guest speakers on a variety of topics and in conjunction with the residential life program. And although the gathering is not a formal service, presentations may include messages pertinent to personal and spiritual growth. Regular Wednesday services in the Chapel of the Atonement offer hymns and readings of sacred texts and prayer, and are often structured according to liturgies found in The Book of Common Prayer. 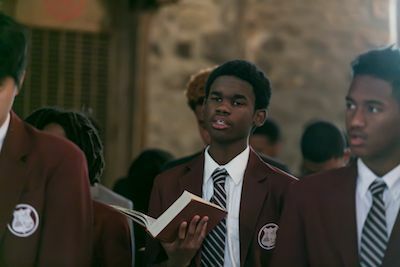 Active participation is strongly encouraged and students are asked to serve as readers, ushers, flag bearers and crucifers; positions of leadership in a common prayer life that nourishes us all. On Sunday mornings, the residential community comes together for a weekly offering of The Holy Eucharist. From time to time, faculty members may also invite students to attend services with them in other houses of worship in the area. Seasonal awards ceremonies and other special events are held in the Chapel to mark a special significance and provide that particular quality of community and spiritual connection warranted by the occasion. The Reverend John Daniels, School Chaplain, provides pastoral care to the CFS community. Students and adults alike are on a great journey upon which spiritual reflection and conversation will be useful and informative. Deeper questions of meaning and a fulfilling human experience appear within our individual and shared experiences, and the Chaplaincy is uniquely situated to respond with a listening ear and caring concern for the wellbeing of all God’s children in the CFS community. It is not uncommon for parents to seek this guidance also. The Chaplain takes part in weekly meetings of the Wellness Committee and is in regular communication with the Guidance Department, Director of Residential Life and the School Nurse. Students and faculty are invited and encouraged to be part of a Chapel Council that guides, plans and administers the regular program. It is advised by the School Chaplain and receives support from outside clergy and leaders of other faith traditions. Students are particularly encouraged to participate and take a leadership role in administering all chapel related events.